There’s no denying that writer and producer Ronald D. Moore is a science fiction great. His work on Star Trek was important to the franchise, while his Battlestar Galactica reboot is considered some of the best television has to offer genre fans. So when Moore sounds off on the current state of science fiction, you know people are going to listen. ‘I think science-fiction for the last 15 or 20 years — on television and in movies — has devolved to just popcorn,’ he says, citing Helix as one of the few examples of more ‘adult’ TV sci-fi. ‘To do something in this genre, it had to be just light and fluffy and silly and adventurous. I’d take these comments with a grain of salt. I find it too convenient that he singles out his newest TV series as the height of science fiction today. However, the moment J.J. Abrams’s Star Trek reboot became more about the action rather than more mature subject matter was a good example of science fiction being more about “popcorn” entertainment. With the success of Gravity and the Marvel movies, studios are happy enough to make crowd-pleasing entertainment rather than something that will actually make you think about the state of the world. But directors such as Neill Blomkamp, Lars von Trier, and Spike Jonze are trying to push the genre to its limits with movies like District 9, Melancholia, and Her, respectively. While the state of sci-fi TV is at its peak with TV shows like Revolution, The Walking Dead, Orphan Black, and Doctor Who, a majority of sci-fi television today is action/adventure based and isn’t as smart as something like classic Star Trek. In England, there’s a TV series called Black Mirror that is pushing the boundaries of the genre, but it’s not readily available in the United States yet. ‘When you do something original, it’s one set of challenges — staring at the blank page and trying to figure out what it is,’ Moore explains. ‘But when you’re starting with a book or an existing property, it’s a different set of challenges. ‘You think, how can I move these pieces around in a different way? How can I give this familiarity without it feeling stale? They’re different intellectual puzzles, but I enjoy both ways of working. While I do feel that science fiction is the perfect genre for social and political commentary, action/adventure movies and television will always be more popular among fans and general audiences, alike. There is room for all different sorts of science fiction, but it’s merely the question of how the genre is serving you. I believe TV Network are the one responsible for the non-evolution of Sci-Fi show. They don’t want to take risk and they believe everyone is too dumb to understand complex storylines. Star Trek was victim of that some 50 years ago and it still the problem today! There are visionnary film and serie maker out there but the network are holding back! 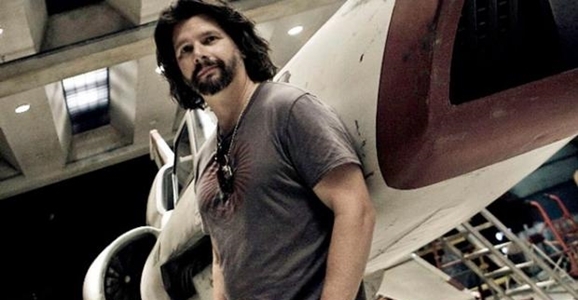 Well said,.The state of SCI-FI today is terrible,the fans know it,Ron Moore knows it,and some writers and film makers know it.However changing the status quo will not be easy, the people who make the movies and TV programs today are not fans of the genre’. We get crap because it makes money and that’s all that really counts.